13. HOW CAN I STORE BATTERIES? Batteries naturally self discharge while in storage, and sulfation will begin occurring when the State-of-Charge is less than 100%. Please see Section 16 for more information on sulfation. Cold will slow the process down and heat will speed it up. Here are six simple steps to store your batteries that will protect them from sulfation and premature failure. 13.1. Physically inspect for damaged cases, remove any corrosion, and clean the tops of the batteries. If the battery is in a vehicle, remove the negative connection from the battery to eliminate the additional parasitic discharge. 13.2. Check the electrolyte levels and add distilled water as required, but avoid overfilling. 13.3. Fully charge and equalize, if required, using the procedures in Section 9. 13.4. Store in a cool dry place, but not so that it will freeze. The freezing point of a battery is determined by the State-of-Charge and the higher it is, the lower the freezing temperature. (Please see the State-of-Charge table in Section 4.) Based on the battery type you are using, connect a voltage regulated float charger (such as a ChargeTek, etc.) or a “smart,” microprocessor based three stage or four stage charger (such as a Battery Tender, BatteryMinder, etc.) to continuously “float” charge your battery. Do not use a cheap, unregulated “trickle” charger or a charger which was not designed for float charging or you will overcharge the battery. 13.5. A less desirable alternative to float recharging would be to periodically test the State-of-Charge using the procedure in Section 4.? When it is 80% or below, recharge using the procedures in Section 9. The frequency of testing and recharging will depend on the ambient storage temperature. 13.6. When you remove the batteries from storage, equalize wet (flooded) or AGM batteries, if required, using the procedure in Section 9. 14. WHAT ARE SOME OF THE BIGGEST MYTHS ABOUT BATTERIES? 14.1. Storing a battery on a concrete floor will discharge them. A hundred years ago when battery cases were made of porous materials such as tar-lined wood boxes, so storing batteries on concrete floor would accelerate their discharge. Modern battery cases are made of polypropylene or hard rubber. These cases seal better, so external leakage-causing discharge is no longer a problem, provided the top of the battery is clean. Temperature stratification within very large batteries could accelerate their internal “leakage” or self-discharge if the battery is sitting on an extremely cold floor in a warm room or is installed in a submarine. 14.2. Driving a car will fully recharge a battery. There are a number of factors affecting an alternator's ability to charge a battery, such as how much current from the alternator is diverted to the battery to charge it, how long the current is available, and the temperature. Generally, idling the engine or short stop-and-go trips during bad weather or at night might not fully recharge the battery. Please see Section 5. 14.3. A battery will not explode. There two types of battery explosions are external and internal. Recharging a wet lead-acid battery produces hydrogen and oxygen gas. While spark retarding vent caps help prevent external battery explosions, sparks occur when jumping, connecting or disconnecting charger, or battery cables and ignite the gas. Internal explosions usually occur while starting the engine and normally blow the caps or cover off and splatter electrolyte all over the engine compartment. The most probable cause is from a combination of low electrolyte levels in the battery and a low resistance bridge formed between or across the top of the plates called "treeing" between a positive and negative plate. When heavy current flows in the battery, a spark occurs and ignites the residual gas in one or more of the cells. A second possible cause is a defect in the weld of one of the plate connecting straps. Periodic preventive maintenance (Please see Section 3. ), working on batteries in well-ventilated areas, or using sealed AGM or gel cell type batteries can significantly reduce the possibility of battery explosions. To neutralize the residual battery acid, be sure to thoroughly wash the engine compartment and the back of the hood with a solution of one-pound baking soda to one gallon of warm water. The largest number of battery explosions, while starting an engine, occurs in hot climates. While not fatal, battery explosions cause thousands of eye and burn injuries each year. Should a battery explosion occur and battery electrolyte (or battery acid) get in someones' eyes, flush them out with any drinkable liquid immediately because seconds count. 14.4. A battery will not lose its charge sitting in storage. 14.5. “Maintenance free” batteries never require maintenance. 14.6. Test the alternator by disconnecting the battery with the engine running. A battery as like a voltage stabilizer or filter to the pulsating DC produced by the alternator. Disconnecting a battery while the engine is running can destroy the sensitive electronic components connected to the electrical system such as the emission computer, audio system, cell phone, alarm system, etc., or the charging system because the peak voltage can rise to 40 volts or more. In the 1970s, removing a battery terminal was an accepted practice to test charging systems of that era. That is not the case today. 14.7. Pulse chargers, aspirins or additives will revive sulfated batteries. Using pulse chargers or additives is a very controversial subject. Most battery experts agree that there is no conclusive proof that pulse chargers work any better than constant voltage chargers to remove sulfation. They also agree that there is no evidence that additives or aspirins provide any long-term benefits. Short term gains are achieved by increasing the acidity of the battery. 14.8. On really cold days turn your headlights on to “warm up” the battery up before starting your engine. While there is no doubt that turning on your headlights will increase the current flow in a car battery, it also consumes valuable capacity that could be used to start the cold engine. Therefore, this is not recommended. For cold temperatures, externally powered battery warmers or blankets and engine block heaters are highly recommended if the vehicle can not be parked in a heated garage. AGM and Ni-Cad batteries will perform better than other types of wet Lead-acid batteries in extremely cold temperatures. 14.9. Car batteries last longer in hot climates than in cold ones. 14.10. Charging Cables or an Auto Jump Starter will start your car. The cigarette lighter charging cable's advertising states “ charges weak batteries in minutes.” There is little doubt that charging cable products will certainly recharge your car battery if you have enough time and your battery is in good condition. Cigarette lighters are normally fused at 10 amps, so to be safe they probably limit current flow to 7.5 amps. Given the size of the cord, the amount might be even less. They work by applying higher voltage from the good battery to “recharge” the bad one. Now let's assume it is a hot day and that you need just of 3% of the battery's capacity to start the engine from a 40 ampere-hour battery. This means you will need at least 7.5 amps for 10 minutes to flow from the good battery to the bad one. Now let's also assume that it is below freezing and you have left your lights on. You will need at least 50% capacity or 20 amp hours to start the vehicle. This will take over two hours to partially charge the dead battery. An auto jump starter uses special high current batteries to provide up to 900 peak amps to start your engine. It can provide 200-300 amps for up to 8-10 seconds. After this, the unit has to be recharged for 24 to 48 hours. Standard AA alkaline batteries are used to trickle charge the special batteries. This type of emergency starter should start all but diesel engines up to six or eight times, depending on the condition of the engine and the temperature. 14.11. A larger capacity battery will damage my car. A starter motor will only draw a fixed amount of current from the battery, based on the resistance of its load. A larger current capacity battery supplies only what is required. It will not damage your vehicle. Using batteries with higher or lower voltage or too tall can damage your vehicle. 14.12. Lead-acid batteries have memories. Lead-acid batteries do not have the “memory effect” found with first generation Ni-Cad batteries; however, continuous undercharging will lower the capacity of the battery. Deep discharges can also damage starting batteries or can shorten their lives. 14.13. Bad batteries will not harm the charging system or starter. A bad or weak battery causes more stress on a charging system or starter and can cause premature failures due having to compensate the voltage or current. If you replace a battery, alternator, voltage regulator or starter, you should test the other three components for latent or permanent damage. 15. HOW LONG CAN I PARK MY VEHICLE? The amount of time, usually referred to as "airport or garage time", that you can leave your vehicle parked and still start your engine is based on such things as the battery's State-of-Charge, the Reserve Capacity, the amount of natural self-discharge and parasitic load, and temperature. Car manufacturers normally design for at least 14 days or more airport time; they assume a fully charged battery in good condition, moderate weather, and no additions to the original car's parasitic load (for example, an after market alarm system). When a battery drops below 100% State-of-Charge, sulfation starts occurring, and this can also reduce the capacity of the battery. 15.1. The best option is to connect an voltage regulated float charger or solar float charger to your car battery. You will need 13.2 VDC and at least .5 amps (500 milliamps) to overcome the natural self-discharge and parasitic load. 15.2. Install a battery with a larger reserve capacity. 15.3. Jump the battery and hope that there is no latent damage. 15.4. Connect a battery in parallel. 15.5. Disconnect the negative terminal, but be sure that you have saved any security codes or radio stations presets that will have to be reprogrammed. 15.6. Replace the battery, especially if it is over three years old or sealed, and you live in a hot climate. 15.7. Have someone drive your car during the day on the highway every two weeks 10 to 15 minutes to recharge the battery. 16. HOW CAN I REVIVE A SULFATED BATTERY? Starting and other lead-acid batteries are perishable. During the discharge process, soft lead sulfate crystals are formed in the pores and on the surfaces of the positive and negative plates inside a lead-acid battery. When a battery is left in a discharged condition, is continually under charged, or the electrolyte level is below the top of the plates, some of the soft lead sulfate re-crystallizes into hard lead sulfate. It cannot be reconverted during subsequent recharging. This creation of hard crystals is commonly called "lead sulfation". It accounts for over 80% of the deep cycle lead-acid battery failures. The longer sulfation occurs, the larger and harder the lead sulfate crystals become. The positive plates will be light brown and the negative plates will be dull, off white. These crystals lessen a battery's capacity and ability to be recharged. Sulfation is a result of lead-acid battery discharge while in storage, which is a consequence of parasitic load and natural self-discharge. Parasitic load is the constant electrical load present on a battery while it is installed in a vehicle even when the ignition switch is turned off. The load is from the continuous operation of electrical appliances, such as, an emissions computer, a clock, security system, maintenance of radio station presets, etc. While disconnecting the negative battery cable will eliminate the parasitic load, it has no affect on the other problem, the natural self-discharge of battery. Thus, sulfation can be a huge problem for lead-acid batteries while sitting on a dealer's shelf, in a basement, or in a parked vehicle, especially in hot temperatures. 16.1. How do I prevent sulfation? The best way to prevent sulfation is to keep a lead-acid battery fully charged because lead sulfate is not formed. This can be accomplished three ways. The best solution is to use a charger that is capable of delivering a continuous "float" charge at the battery manufacturer's recommended float or maintenance voltage for a fully charged battery. 12-volt batteries, depending on the battery type, usually have fixed float voltages between 13.2 VDC and 13.6 VDC, measured at 70° F (21.1° C) with an accurate (.5% or better) digital voltmeter. Charging can best be accomplished with a microprocessor controlled three stage or four stage charger, such as a Battery Tender (Deltran), Truecharge (Statpower), BatteryMinder, Schumacher, etc., or by voltage regulated float charger set at the correct voltage, such as a ChargeTek, etc. By contrast, a cheap, unregulated "trickle" charger or manual two stage charger can over charge a battery and destroy it. A second and less desirable method is to periodically recharge the battery when the State-of-Charge drops to 80% or below. At 70° F (21.1° C), a battery with 100% State-of-Charge measures approximately 1.261 Specific Gravity or 12.63 VDC and at 80% State-of-Charge, it measures 1.229 Specific Gravity or 12.47 VDC. Maintaining a high State-of-Charge tends to prevent irreversible sulfation. The recharge frequency is dependent on the parasitic load, temperature, the battery's condition, and plate formulation (battery type). Temperature matters! Lower temperatures slow down electro chemical reactions and higher temperatures speed them up. A battery stored at 95° F (35° C) will self-discharge twice as fast than one stored at 75° F (23.9° C). A third technique is to use a regulated solar panel or wind generator designed to float charge the battery. This is a popular solution when AC power is unavailable for charging. 16.2. How do I recover sulfated batteries? Apply a constant current from one to two amps for 48 to 120 hours at 14.4 VDC, depending on the electrolyte temperature and capacity of the battery. Cycle (discharge to 50% and recharge) the battery a couple of times and test its capacity. You might have to increase the voltage in order to break down the hard lead sulfate crystals. If the battery gets above 110° F (43.3° C) then stop charging and allow the battery to cool down before continuing. Replace the electrolyte with DISTILLED water, let stand for one hour, apply a constant current at four amps at 13.8 VDC until there is no additional rise in specific gravity, remove the electrolyte, wash the sediment out, replace with fresh electrolyte, and recharge. If the specific gravity exceeds 1.300, then remove the old electrolyte, wash the sediment out, and start over with distilled water. You might have to increase the voltage in order to break down the hard lead sulfate crystals. If the battery gets above 110° F (43.3° C) then stop charging and allow the battery to cool down before continuing. Cycle (discharge to 50% and recharge) the battery a couple of times and test capacity. The sulfate crystals are more soluble in water than in electrolyte. As these crystals are dissolved, the sulfate is converted back into sulfuric acid and the specific gravity rises. This procedure will only work with some batteries. 9. HOW DO I RECHARGE (OR EQUALIZE) MY BATTERY? There are up to four phases of battery charging: bulk, absorption, equalization and float. The bulk stage is where the charger current is constant and the battery voltage increases. You can give the battery whatever current it will accept as long as it does not to exceed 20% of the ampere-hour rating and that it will not cause overheating. The absorption phase is the phase where the charger voltage is constant and current decreases until the battery is fully charged. This normally occurs when the charging current drops off to 1% or less of the ampere-hour capacity of the battery. For example, end current for a 50 ampere-hour battery is approximately 0.5 amps (500 milliamps) or less. The optional equalizing phase is a controlled 5% overcharge to equalize and balance the voltage and specific gravity in each cell by increasing the charge voltage. Equalizing reverses the build-up of the chemical effects like stratification where acid concentration is greater in the bottom of the battery. It also helps remove sulfate crystals that might have built up on the plates. The frequency recommendation varies by manufacturer from once a month to once a year or is based on a specific gravity test where the difference between cells is .030 (or 30 “points”). To equalize, fully recharge the battery. At this point, increase the charging voltage to the manufacturer's recommendations, or if not available, add 5%. Heavy gassing should start occurring. Take specific gravity readings in each cell once per hour. Equalization has occurred once the specific gravity values no longer rise during the gassing stage. The optional float phase is where the charge voltage is reduced, then held constant and is used to indefinitely maintain a fully charged battery. Please refer to Section 13 for more information about storing batteries and float charging them. 9.1. Never disconnect a battery cable from a car with the engine running, because the battery acts like a filter for the electrical system. Unfiltered (pulsating DC) electricity sometimes exceeding 40 volts and can damage expensive electrical components such as computers, radio, charging system, etc. 9.2. Before recharging check the electrolyte level and insure it covers the plates at all times and that it is not frozen. 9.3. Avoid adding distilled water if the electrolyte is covering the top of the plates because during the recharging process, it will warm and expand. After recharging has been completed and the battery has cooled, recheck the levels. 9.4. Insure the vent caps are clean. Reinstall the vent caps before recharging, recharge ONLY in well-ventilated areas, and wear protective eye ware.? Do not smoke or cause sparks or flames while the battery is being recharged because batteries give off explosive gas. 9.5. If your car battery is sealed, avoid recharging with current above 20% of the RC (or 50% of the ampere hour) rating. For example, 24 amps maximum for a 120 minute RC (48 ampere hour) rated battery. 9.6. Follow the battery and charger manufacturers' procedures for connecting and disconnecting cables. Operate in a manner to minimize the possibility of an explosion or incorrectly charge the battery. You should turn the charger OFF before connecting or disconnecting cables to a battery. Do not wiggle the cable clamps while the battery is recharging, because a spark might occur and this might cause an explosion. Good ventilation or a fan is recommended to disperse the gas created by the recharging process. 9.7. If a battery becomes hot, over 110° F (43.3° C), or violent gassing or spewing of electrolyte occurs, turn the charger off temporarily or reduce the charging rate. This will also prevent “ thermal runaway” that can occur with VRLA (AGM or Gel cell) batteries. 9.8. Insure that charging the battery in the car with an external manual charger will not damage the car's electrical system with high voltages. If this is even a remote possibility, then disconnect both battery cables from the battery before connecting the charger. 9.9. If you are recharging gel cell batteries, a manufacturer's charging voltages can be very critical. Sometimes, you might need special recharging equipment. In most cases, standard deep cycle chargers used to recharge wet batteries cannot be used to recharge gel cell and AGM batteries because of their charging profiles; using them will shorten battery life or cause “thermal runaway”. Match the charger (or charger's setting) for the battery type you are recharging or floating. Usually when a car is jump started, it is not driven long enough to fully recharge the battery. The length of time to fully recharge the battery depends on the amount of discharge, the amount of surplus current that is diverted to the battery, how long the engine is run, engine speed, and ambient temperature. An alternator is sized by the car manufacturer to carry the maximum accessory load and to maintain a battery and NOT to recharge a dead battery. For example, if 300 amps were consumed for two seconds to start a car from a fully charged battery, it will take an 80 amp charging system approximately nine seconds to replace the power used. If 25 amps are available to recharge the battery, it will take 30 seconds and twelve minutes at one amp. With a dead 120 minute RC battery, it would take approximately 45 minutes at 80 amps, 2.4 hours at 25 amps, or 60 hours at one amp to obtain a 90% State-of-Charge. If you have added lights, audio amplifiers, two-way radios or other high powered accessories to your vehicle and engage in stop-and-go driving, the alternator might not produce enough current to keep your battery fully charged. You might need to increase the capacity of the charging system. Ideally the combined load of all the accessories should be less than 75% of the charging system's maximum output, so that at least 25% is available to recharge the battery. Another method is to slowly recharge the battery at 70° F (21.1° C) over a ten-hour period (C/10) using an external constant voltage (or tapered current charger). This technique allows the acid more time to penetrate the plates and there is less mechanical stress on the plates. C-rate is a measurement of the charge or discharge of battery overtime. It is expressed as the Capacity of the battery divided by the number of hours to recharge or discharge the battery. For example, a 120-minute RC (48 ampere-hour) battery would have a charging or discharging rate of 4.8 amps for ten hours. A constant voltage or “automatic” charger applies regulated voltage at approximately 14.4 volts with the electrolyte at 70° F (21.1° C). An automatic charger should stop charging when the battery has a full charge. There is less chance of over charging a battery than with a manual charger. A 10-amp automatic charger will cost approximately $50 at an auto parts store and is suitable for most simple automotive recharging charging applications. The best charger is the more expensive four-stage microprocessor-controlled chargers. They will automatically switch between bulk, absorption, float, and equalizing charging. A less expensive three-stage version has bulk, absorption and float charging capability. The micro process based chargers can be continuously connected to the battery and will keep it fully charged. A one to two-amp three-stage version, such as Battery Tender, BatteryMinder, etc., costing between $40 and $60 are excellent chargers for a battery or vehicle in storage. To compensate for electrolyte temperature, which has a negative temperature compensation coefficient, adjust the charging voltage .0028 (2.8 millivolts) to .0033 (3.3 millivolts) volts/cell/degree F.? For example, if the temperature is 30° F (-1.1° C), then increase the charging voltage to 15.19 volts for a wet low maintenance battery.? If 100° F (43.3° C), then decrease the charging voltage to 13.81 volts. If left unattended, cheap, unregulated trickle or manual battery chargers can overcharge your battery because they can “decompose” the water out of the electrolyte.? Avoid using fast, high rate, or boost chargers on any battery that is sulfated or deeply discharged.? The electrolyte should never bubble violently while recharging because high currents only create heat and excess explosive gasses. 10. WHAT CAUSES MY BATTERY TO DRAIN OVERNIGHT? Parasitic (or key off) drain is the cumulative load produced by electrical devices, for example, clocks, computers, alarms, etc., that operate after the engine is stopped and the ignition key has been switched off. Parasitic loads typically are 20 to 120 milliamps. When the parasitic load is great than 120 milliamps, batteries will drain more quickly. Glove box, trunk, and under hood lights that do not automatically turn off when the door is closed or shorted diodes in alternators are the most common offenders. Cooling fans, power seat belt retractors, radios and dome lights left on, alarm systems, and electric car antennas have also caused batteries to drain overnight. Leaving your headlights on will generally discharge a fully charged battery, with 90 minutes of Reserve Capacity (36 ampere hours), within a couple of hours. 10.1. Connect a 12-volt bulb in series between the negative battery cable terminal clamp and the negative battery terminal. If the bulb glows brightly, then start removing fuses one-at-a-time until the offending electrical component is identified. 10.2. A better approach is to use a DC ammeter inserted in series with the negative battery terminal. Starting with the highest scale, determine the current load. If the load is above 120 milliamps, then start removing fuses one-at-a-time until the offending electrical component is identified. 11. CAN I INCREASE THE LIFE OF MY BATTERY? Protecting your battery from high under hood temperatures and keeping your battery full charged at all times and well maintained are the best ways to extend the life of your battery. 11.1. For cold climates, keeping the battery fully charged and the engine warm will help increase the life of the battery. In hot climates and during the summer, the electrolyte levels need to be checked more frequently and distilled water added, if required. This is due to high under hood temperatures. In a study conducted by the Society of Automotive Engineers (SAE), the under hood temperature has increased 30% since 1985. Chrysler studies have shown that relocating the battery outside the engine compartment has increased the average battery life by eight months. Relocating the starting battery to the trunk or passenger compartment, as Mazda did in their Miata a number of years ago, is becoming more popular. This battery placement is being used by a number of car manufacturers to protect the batteries from the high under hood temperatures. However, sealed gel cell or AGM type batteries must be used because they produce little or no gas. Some battery manufacturers build “hot climate” or “South” versions by special plate and connecting strap formulations or increasing the amount of electrolyte in the battery to provide more “cooling”. 11.2. In the warmer climates and during the summer, “watering” is required more often. Check the electrolyte levels and add distilled water, if required. Never add electrolyte to battery that is not fully charged, just add distilled water and do not overfill. The plates must be covered at all times and keep the top of the battery clean. 11.3. Turning off unnecessary accessories and lights before starting your car will decrease the load on the battery while cranking, especially when it is cold. 11.4. Leaving your lights or other accessories on and fully discharging the battery can ruin it, especially if it is a maintenance free type. If this should occur, you should load test the battery AFTER it has been fully recharged and with the surface charge removed to determine if there is any latent or permanent damage. 11.5. Reducing the parasitic (key-off) load to below 120 milliamps. 11.6. In cold climates, increasing the diameter (smaller numbered wire gauge) of the battery cables will increase the power available to the starter motor. 12. WHAT ARE THE MOST COMMON CAUSES OF PREMATURE BATTERY FAILURES? Normally, premature battery failures are caused by one or more of the failures listed below. Prior to 1980, plate or grid shorts were the most common failure. Since then the manufacturers have significantly improved the reliability by using improved separators and plate alloys to reduce corrosion. Batteries that have been in use for longer periods of time will typically fail from multiple causes. All batteries will fail at some point in time. 12.4. High under hood heat or overcharging causes a loss of water (which accounts for over 50% of the failures), accelerated positive grid corrosion or plate-to-strap shorts. 12.6. Deep discharges (such as leaving your lights on). 12.7. Misapplication or using an undersized battery that causes discharges greater than 10%. 12.8. Excessive vibration due to a loose hold down clamp. 12.9. Using tap water which can cause calcium sulfation. 12.10. Freezing due to a discharged battery. 5. HOW DO I KNOW IF MY CHARGING SYSTEM IS OK OR LARGE ENOUGH? Your car's charging system is composed of an alternator (or DC generator), voltage regulator, battery, and indicator light or gauge. While your engine is running, the charging system's primary purpose is to provide power for the car's electrical load, for example, ignition, lighting, audio system, accessories, etc., and to recharge your car's battery. Its output capacity is directly proportional to the RPM of the engine. Charging systems are normally sized by the car manufacturers to provide approximately 125% of the worst-case OEM electrical load, so that the battery can be recharged. When the charging system fails, usually an indicator light will come on or the voltage (or amp) gauge will not register “good”. The most common charging system failure is a loose, worn or broken alternator belt, so check it first. If you increase the engine speed and the alternator light becomes brighter, then the battery needs to be fully recharged and tested. If the light becomes dimmer then the problem is most likely in the charging system. The indicator or idiot light is a comparison between the voltage output of charging system and the voltage output of the battery. The next test requires use of a known-to-be-good, fully charged battery. Attach this battery to the engine and run the engine at 2000 RPM or more for two minutes. Depending on the load and ambient temperature, the voltage should increase to between 13.0 and 15.1 volts. Most cars will measure between 13.8 and 14.8 volts on a warm day, depending on the battery type that the charging system was designed for. Most voltage regulators are temperature compensated to properly charge the battery under different environmental conditions. As the ambient temperature decreases, the charging voltage is increased to overcome the higher battery resistance. Conversely, as the ambient temperature increases, the charging voltage is decreased. Other factors affecting the charging voltage are the battery's condition, State-of-Charge, sulfation, electrical load and electrolyte purity. If a battery terminal's voltage is below 13.0 volts and the battery tests good after being recharged, or if you are still having problems keeping the battery charged, then have the charging system's output voltage and load tested. Also, have the car's parasitic load, the electrical load with the ignition key turned off, tested. (Please see Section 10.) A slipping alternator belt or open diode will significantly reduce the alternator's output capacity. If the output voltage is above 15.1 volts with the ambient temperature above freezing, if the battery's electrolyte level frequently to be low, or if you smell “rotten egg” order around the battery, then the battery is being over charged and the charging system should be tested. What if you cannot keep your battery recharged and the battery tests OK? The vehicle's electrical load is first satisfied by the charging system, and any remaining power, if any, is used to recharge the battery. For example, if the total electrical load is 14 amps and the charging system is producing 30 amps at 2500 RPM, then up to 16 amps will be available for recharging the battery and take approximately six minutes. If the charging system is operating at say a maximum capacity of 80 amps at 5000 RPM, then the battery usually will be recharged within two minutes. Now let us assume that the engine is idling and the charging system is only capable of producing 10 amps. Four amps from the battery are required to make up the difference to satisfy the 14 amp electrical load. The battery is being discharged further. This example is why that during short trips or driving in stop-and-go traffic, the battery may never get recharged and may even “completely” discharged. Using the example above, let's assume that you add an after-market, high-power audio system or lights that adds 20 amps of load. With a total electrical load of 34 amps, at RPM below 2500, the battery will never be recharged with an 80-amp system. During operation, the battery must make up the deficit. The solution is to upgrade the charging system to 125% or more of the new worst-case load. In this example, based on your stop and go driving habits you would need a high output charging system capable of 105 amps or more. High temperatures can further reduce the maximum output of a charging system. 6. HOW DO I JUMP START MY VEHICLE? In cold weather, a good quality booster cable with six-gauge (or less) wire is necessary to provide enough current to the disabled vehicle to start the engine. Larger diameter wire is better? Please check the owner's manual for both vehicles before attempting to jump-start. Follow the manufacturers' procedures because some good cars should not be running during a jump-start of a disabled one? However, starting the disabled vehicle with the good vehicle running can prevent having both vehicles disabled. Avoid the booster cable clamps touching each other or the POSITIVE clamp touching anything but the POSITIVE (+) post of the battery. Momentarily touching the block or frame can cause extensive and costly damage. These procedures assume that both vehicles are negatively grounded and that the electrical system voltages are the same. 6.1. If below 10° F (-12.2° C) wind chill, insure that the electrolyte is NOT frozen in the dead battery. If frozen, check for a cracked case. If the case is OK, thaw the battery before proceeding. The electrolyte in a dead battery will freeze at approximately 13° F (-10.6° C). 6.2. Without the vehicles touching, turn off all unnecessary accessories and lights on both cars, insure there is plenty of ventilation, and wear some some glasses or protective eye ware. 6.3. Start the vehicle with the good battery and let it run for at least two or three minutes at fast idle to recharge its battery. Check the positive and negative terminal markings on both batteries before proceeding. 6.4. Connect the POSITIVE booster cable clamp (usually red) to the POSITIVE (+) terminal on the dead battery. Connect the POSITIVE clamp on the other end of the booster cable to the POSITIVE (+) terminal on the good battery. 6.5. Connect the NEGATIVE booster cable clamp (usually BLACK) to the NEGATIVE (-) terminal on the good battery and the NEGATIVE booster cable clamp on the other end to a clean, unpainted area on the engine block or frame on the disabled vehicle and away from the battery. This arrangement is used because some sparking will occur, and you want to keep sparks as far away from the battery as practical in order to prevent a battery explosion. 6.6. Let the good vehicle continue to run at high idle for five minutes or more to allow the dead battery to receive some recharge and to warm its electrolyte. If there is a bad jumper cable connection, do not wiggle the cable clamps connected to the battery terminals because sparks will occur and a battery explosion might occur. To check connections, first disconnect the clamp from the engine block, check the other connections, and then reconnect the engine block connection last. 6.7. Some vehicle manufacturers recommend that you turn off the engine of the good vehicle to protect its charging system prior to starting the disabled vehicle. Check the owner's manual; otherwise, leave the engine running so you can avoid being stranded should you not be able to restart the good vehicle. 6.8. Start the disabled vehicle and allow it to run at high idle. If the vehicle does not start the first time, recheck the connections, wait a few minutes, abd try again. 6.9. Disconnect the booster cables in the reverse order, starting with the NEGATIVE clamp on the engine block or frame of the disabled vehicle to minimize the possibility of an explosion. 6.10. As soon as possible, fully recharge the jumped battery, remove the surface charge and load test for latent or permanent damage as a result of the deep discharge. This is especially important if you are using sealed maintenance free battery, like an ACDelco for example. The wet (or flooded) low maintenance batteries have a lead-antimony/ calcium (dual alloy or hybrid) plate formulation. Some battery manufacturers, such as Johnson Controls, build “North” and “South” battery versions to make up for the differences in cold and hot climates. For off road applications in trucks, recreational vehicles (RVs), motor caravans, 4x4's, vans or SUV's (Sport Utility Vehicles), some manufacturers build “high vibration ”, commercial, or RV battery versions designed to reduce the effects of moderate vibration. Some also construct special batteries that have a higher tolerance to heat by changing plate or connecting strap formulations or providing for more electrolyte. If you replace a sealed maintenance free battery in a GM vehicle, such as an ACDelco, with a non-sealed lead-antimony or lead- antimony/calcium low maintenance battery, you will need to check the electrolyte levels more often. This is because GM sets their voltage regulators at higher charging voltage, 14.6 to 14.8 volts, to recharge the sealed maintenance free lead-calcium/calcium batteries. Maintenance free batteries have a lead-calcium/calcium formulation, for example, Delphi's ACDelco. The advantages of maintenance free batteries over low maintenance are: less preventive maintenance, up to 250% less water loss, faster recharging, greater overcharge resistance, reduced terminal corrosion, up to 40% more life cycles, up to 200% less self discharge, and less danger to consumers because there is less to service. However, they are more prone to deep discharge (dead battery) failures due to increased shedding of active plate material and development of a barrier layer between the active plate material and the grid metal. If sealed, a shorter life in hot climates is often experienced because water cannot be replaced. Maintenance free batteries are generally more expensive than low maintenance batteries. AGM GRT (Recombinant Gas Technology) batteries have all of the advantages of the maintenance free batteries plus a lower self- discharge rate; longer life; a higher resistance to vibration, deep discharge failure, and heat; and can be used inside a passenger compartment. This is because vehicle manufacturers want to extend their “bumper-to-bumper” warranty periods, to relocate the battery from under the hood to avoid temperature extremes, to provide more weight in the rear, or to save under-hood space. They are more expensive than maintenance free starting batteries. In the future, you can expect AGM batteries in the $80 to $120 price range. Examples of AGM batteries are Concorde's Lifeline, Delphi's Freedom Extra, and ACDelco's Platinum. An AGM battery can normally replace a wet low maintenance battery, but a wet low maintenance battery normally cannot replace an AGM battery without possibly adjusting the charging voltages. Expect to see 36-volt AGM car batteries with 14/42-volt dual or 42-volt electrical systems introduced by some of the car manufacturers in 2003. For excessive vibration applications in off-road operation or extreme conditions, it is best to use a Spiralcell® AGM battery because it is sealed and there is no shedding of active plate material since the plates are immobilized and longer life. In addition, it has all of the advantages of the AGM starting battery, maintenance free, smaller, faster recharging time, and does not require special shipping. Examples of Spiralcell® AGM batteries are Optima and Exide's Select Orbital. Starting batteries are specially designed with thinner and more plates for high initial amp applications and shallow discharges. Cars usually start within 15 seconds and typically consumes 1%-3% of the battery's capacity. Car batteries should not be discharged below 90% State-of-Charge. By contrast, marine starting batteries are designed for prolonged discharges at lower amperage that typically consumes between 20% and 50% of the battery's capacity. Deep cycle batteries typically are discharged in a range of between 50% and 80% of the capacity. The second most important consideration is that the battery's CCA rating meets or slightly exceeds, your car's OEM cranking requirement, for your climate. CCA are the discharge load measured in amps that a new, fully charged battery, operating at 0° F (-17.8° C), can deliver for 30 seconds and while maintaining the voltage above 7.2. Batteries are sometimes advertised by their CA (Cranking Performance Amps), MCA (Marine Cranking Amps) measured at 32° F (0° C), or HCA (Hot Cranking Amps) measured at 80° F (26.7° C). These measurements are not the same as CCA. Do not be misled by the higher CA, MCA or HCA ratings. To convert CA to CCA, multiply the CA by 0.8. To convert HCA to CCA, multiply HCA by 0.69. To start a four cylinder gasoline engine, you will need approximately 600-700 CCA; six cylinder gasoline engine, 700-800 CCA; eight cylinder gasoline engine, 750-850 CCAs; three cylinder diesel engine, 600-700 CCA; four cylinder diesel engine, 700-800 CCA; and eight cylinder diesel engine, 800-1200 CCA. 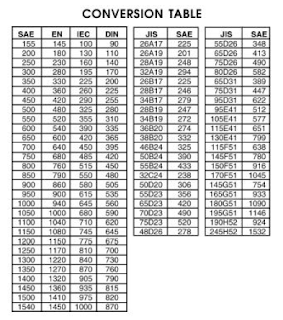 To convert CCA, a SAE (Society of Automotive Engineers) standard, to an EN, IEC, DIN or JIS standard, please refer to the following table. In hot climates, buying batteries with double or triple the cranking amps that exceeds your starting requirement is a waste of money. However, in colder climates the slightly higher CCA rating is better, due to increased power required to crank a sluggish engine and the inefficiency of a cold battery. As batteries age, they are also less capable of producing CCA. According to the BCI (Battery Council International), diesel engines require 220% to 300% more current than their gasoline counterparts and winter starting requires 140% to 170% more current than the summer. These increased requirements are account for in the OEM CCA recommendation. If more CCA capacity is required, two identical 6-volt large starting batteries can be connected in series or two identical 12-volt starting batteries can be connected in parallel. Please refer to the diagrams in Section 7.2 below for more information about connecting batteries in series and parallel. If you connect two 12-volt batteries in parallel, and they are identical in type, age and capacity, you can potentially double your original capacity. If you connect two that are not the same type, you will either overcharge the smaller of the two, or you will undercharge the larger of the two. Connecting two batteries in series is better that two in parallel. Within a BCI group size, the battery with more CCA will have more plates because a larger surface area is required to produce the higher current. The second most important consideration is the RC (Reserve Capacity) rating because of the effects of increased parasitic (ignition key off) loads while long term parking and emergencies. RC is the number of minutes a fully charged battery at 80° F (26.7° C) can be discharged at 25 amps until the voltage falls below 10.5 volts. European and Asian starting and deep cycle batteries are usually rated in Ampere-Hours. To convert Reserve Capacity and Amphours, check the battery manufacturer's specifications. More RC is better in every case! In a hot climate, for example, if your car has a 360 OEM cold cranking amps requirement, then a 400 CCA rated battery with 120 minutes of RC and more electrolyte for cooling would be more desirable than one with 600 CCA with 90 minutes of RC. There is also a relationship between the weight of the battery and the amount of RC. A heavier battery has more lead and is better. Adding more Reserve Capacity can be done in three ways. The best way is to add a deep cycle battery and a diode isolator to your existing starting battery. This is a standard setup in most RVs (Recreational Vehicles). The advantage of this multi-battery setup is that the high-powered accessories can be connected to a deep cycle battery (or batteries) and the car battery is available to start the engine. A second advantage of using a deep cycle battery to power the high-powered accessories is that it can be discharged and recharged hundreds of times without damaging the battery. A starting battery is not designed for deep discharges and will have a very short cycle life if it is abused by deep discharges. A third advantage is that both batteries will be recharged automatically when the charging system has power available. A second way of increasing Reserve Capacity is by replacing the existing car battery with two identical large six-volt deep cycle batteries connected in series or a large, 12-volt deep cycle battery. The deep cycle batteries must have enough cold cranking amps to start the engine in your climate. The third way of increasing Reserve Capacity is by connecting two identical 6-volt large starting batteries in series or two identical 12-volt starting batteries in parallel. Please refer the diagrams below for more information on connecting batteries in series and parallel. If you connect two 12-volt batteries in parallel and they are identical in type, age and capacity, you can potentially double your original capacity. If you connect two that are not the same type, you will either overcharge the smaller of the two, or you will undercharge the larger of the two. Connecting two 6-volt batteries in series is always better that two 12-volt batteries in parallel. By connect this way, the batteries will discharge and recharge equally. When connecting in series or parallel and to prevent recharging problems, do not mix old and new batteries or ones with different types or capacities. Battery cable lengths should be kept short and the cable diameter should be sized large enough to prevent significant voltage drop (.2 volts (200 millivolts) or less) between batteries. Manufacturers build their batteries to an internationally adopted Battery Council International (BCI) group number (24, 34, 35, 65, 75, 78, etc.). These specifications, which are based on the physical case size, terminal placement, type and polarity is used primarily in North America. In Europe, the EN, IKC, Italian CEI, and German DIN standards are used. In Asia, the Japanese JIS standard is used. The OEM battery group number is a good starting place to determine the replacement group. Within a group, the CCA and RC ratings, warranty and battery type will vary within models of the same brand or from brand to brand. Batteries are generally sold by model, so the group numbers will vary for the same price. This means that for the same price, you can potentially buy a physically larger battery with more CCA or RC than the battery you are replacing. For example, a 34/78 group might replace a smaller 26/70 group and give you an additional 30 minutes of RC. If you buy a physically larger battery, be sure that the replacement battery will fit, the cables will connect to the correct terminals, and that the terminals will NOT touch metal surfaces such as the hood when it is closed. BCI and the battery manufacturers publish application selection guides that contain OEM cold cranking amperage requirements and group number replacement recommendations by make, model and year of car, battery size, and CCAs and RC specifications. You can also find BCI size information here and some of the selection guides at http://www.jgdarden.com/batteryfaq/batbrand.htm. Manufacturers might not build or the store might not carry all the BCI group numbers. To reduce inventory costs, dual terminal “universal” batteries that will replace several group sizes are becoming more popular and fit 75% or more of cars on the road today. There are six types of battery terminals: SAE Post, GM Side, “L ”, Stud, combination SAE and Stud, and combination S.A.E Post and GM Side. For automotive applications, the SAE Post is the most popular, followed by GM Side, then the combination “dual” SAE Post and GM Side. “L” terminal is used on some European cars, motorcycles, lawn and garden equipment, snowmobiles, and other light duty vehicles. 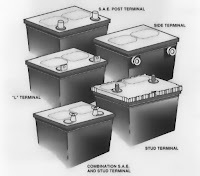 Stud terminals are used on heavy duty and deep cycle batteries. The positive SAE Post terminal in slightly larger (by 1/16 inch;) than the negative one. Terminal locations and polarity will vary. Battery manufacturers or distributors will often “private label” their batteries for large chain stores. An alphabetical list in order of the largest battery manufacturers/distributors and some of their brand names, trademarks and private labels maybe found at http://www.jgdarden.com/batteryfaq/batbrand.htm or email Bill Darden at mailto:bjb_darden@yahoo.com. Ownership, branding, Web addresses and telephone numbers are subject to change. Exide is the largest battery manufacturer in the world, and Johnson Controls is the largest manufacturer in the Americas. Determining the “freshness” of a battery is sometimes difficult. Never buy a non-sealed wet lead-acid battery that is more than three months old or a sealed wet lead acid battery that is more than six months old. This is because it has started to sulfate, unless it has periodically been recharged or it is “dry charged”. The exceptions to this rule are AGM and Gel Cell batteries that can be stored up to 12 months before the State-of- Charge drops below 80%. Please see Section 16. for more information on sulfation. Dealers will often place their older batteries in storage racks so they will sell first. The fresher batteries can often be found in the rear of the rack or in a storage room. The date of manufacture is stamped on the case or printed on a sticker. Dates are stamped on the cover near one post. The first number is the year. The second character is the month A-M, skipping I. The last two characters indicate geographic areas. For example 0BN3=2000 February. Douglas uses the letters of their name to indicate the year of manufacture and the digits 1-12 for the month. D=1994 O=1995 U=1996 G=1997 L=1998 A=1999 S=2000 For example S02=2000 Feb.
Usually on a sticker or hot-stamped on the side of the case. A=January, B=February, and the letter I is skipped. The number next to the letter is the year of shipment. For example B0=Feb 2000. The fourth or fifth character is the month. The following numeric character is the year. A-M skipping I. For example RO8B0B=Feb. 2000. If you cannot determine the date code, ask the dealer or contact the manufacturer. Because of sulfation, fresher is definitely better and does matter. As with tire warranties, battery warranties are not necessarily indicative of the quality or cost over the life of the battery. Some dealers will prorate warranties based on the list price of the bad battery, so if a battery failed half way or more through its warranty period, buying a new battery outright might cost you less than paying the difference under a prorated warranty. The exception to this is the free replacement warranty and represents the risk that the manufacturer is willing to assume. A longer free replacement warranty period is better. 8. HOW DO I INSTALL A BATTERY? In a recent marketing study in the U.S., non-professional battery installers installed almost 60% of the approximately 82 million aftermarket batteries that were made in 1999. Car batteries were the fourth most popular item purchased among auto parts. The same study indicated that Wal-Mart (EverStart) has surpassed Sears (DieHard) as the number one battery seller in the United States with Auto Zone (DuraLast) as the most popular of the auto parts stores for batteries. 8.1. Thoroughly wash and clean the old battery, battery terminals and case or tray with warm water to minimize problems from acid or corrosion. Heavy corrosion can be neutralized with a mixture of one pound of baking soda to one gallon of warm water. Wear glasses or safety goggles and, using a stiff brush, brush the corrosion away from yourself. Also, if not obvious, mark the battery cables so you will know which one to reconnect to which battery post or terminal. If you need to save the radio station and emissions computer settings and security codes, then temporarily connect a second battery in parallel to the electrical system before disconnecting the first battery. If active when the key is off, a cigarette lighter plug can be used to easily connect a parallel battery. Cigarette lighter adapters are available at electronics stores like Radio Shack. 8.2. Remove the NEGATIVE cable first because this will minimize the possibility of shorting the battery when you remove the other cable. If you are using a parallel battery. it is a good idea to secure the cable terminal out of the way so that it does not make any unwanted contact. Next, remove the POSITIVE cable and then the hold-down bracket or clamp. If the hold-down bracket is severely corroded, replace it. Dispose of the old battery by exchanging it when you buy your new one or by taking it to a recycling center. According to BCI, roughly 93% of the old battery lead is recycled, making batteries the most completely recycled object of all recycled items. Please remember that batteries contain large amounts of harmful lead and acid, so take great care with safety and please dispose of your old battery properly to protect our fragile environment. 8.3. After removing the old battery, insure that the battery tray, cable terminals, and connectors are clean. Auto parts or battery stores sell an inexpensive wire brush that will clean the inside of terminal clamps and the terminals. If the terminals, cables or hold-down brackets are severely corroded, replace them. Corroded terminals or swollen cables will significantly reduce your starting capability because of their high resistance and inability to carry the high current. 8.4. To prevent corrosion on SAE type post terminals, use the red and green paraffin oil-soaked felt washers found at auto parts stores or thinly coat the terminal, terminal clamps and exposed metal around the battery with a high temperature grease or petroleum jelly (e.g., Vaseline). Do not use the felt or metal washers between the mating conductive surfaces with General Motors-type side terminal batteries. 8.5. Check the positive and negative terminal markings on the replacement battery and place it so that the NEGATIVE cable will connect to the NEGATIVE terminal. Reversing the polarity of the electrical system will severely damage or destroy it. It can even cause the battery to explode. 8.6. After replacing the hold-down bracket, reconnect the cables in reverse order, that is, attach the POSITIVE cable first and the NEGATIVE cable last. For General Motors-type side terminals, check the length of the bolt. Do not over tighten, or you could crack the battery case. 8.7. Before using the battery, check the electrolyte levels and add distilled water to the manufacturers recommended level. Check the State-of-Charge and recharge if necessary. Then recheck the electrolyte levels after the battery has cooled and top off with distilled water as required, but do not overfill. This FAQ assumes 12-volt, six cell, negative grounded, lead-acid SLI batteries used to start gasoline or diesel engines found in most cars, light trucks and vans. The information contained within the FAQ would also apply to starting batteries found in trunks, motorcycles, boats, snowmobiles, jet skis, farm tractors, lawn and garden tractors, SUVs, etc. Aircraft, buses and larger vehicles use higher volt systems. Some aircraft use special purpose AGM and Ni-Cad batteries for starting because of the extreme cold. For 6-volt batteries, divide the voltage by two; for 8-volt batteries, divide by 1.5; for 24-volt batteries, double the voltage; and for 36-volt batteries, triple the voltage. 1.7. Temperature matters! Heat kills car batteries and cold reduces the available capacity. To filter or stabilize the power. To provide extra power for the lighting, two-way radios, audio system and other accessories when their combined load exceeds the capability of the charging system. With a 5% compounded annual growth rate, worldwide sales of SLI batteries represent roughly 63% of the estimated $27 billion annually spent on lead-acid batteries. A 12-volt lead-acid battery is made up of six cells, each producing 2.1 volts and that are connected in series from positive to negative. Each cell is made up of an element containing positive plates that are all connected together and negative plates, which are also all connected together. They are individually separated with thin sheets of electrically insulating, porous material “envelopes” [labeled #3 in the diagram below] that are used as spacers between the positive (usually light orange) and negative (usually slate gray) plates to keep them from electrically shorting to each other. The plates [#2 in the diagram below], within a cell, alternate with a positive plate, a negative plate and so on.? A plate is made up of a metal grid that serves as the supporting framework for the active porous material that is “pasted” on it. After the “curing” of the plates, they are made up into cells, and the cells are inserted into a high-density tough polypropylene or hard rubber case [#1 in the diagram above]. The cells are connected to the terminals [#5 in the diagram above], and the case is covered and then filled with a dilute sulfuric acid electrolyte [#4 in the diagram above]. The battery is initially charged or “formed” to convert yellow Lead Oxide (PbO or Litharge) into Lead Peroxide (PbO2), which is usually dark brown or black. The electrolyte is replaced and the battery is given a finishing charge.? Some batteries are “dry charged” meaning that the batteries are shipped without electrolyte and it is added and charged when they are put into service. There is an excellent detailed description of how battery is made on the BCI (Battery Council International) web site at http://www.batterycouncil.org/made.html. A battery is created by alternating two different metals such as Lead Dioxide (PbO2), the positive plates, and Sponger lead (Pb), the negative plates. Then the plates are immersed in diluted Sulfuric Acid (H2SO4), the electrolyte. The types of metals and the electrolyte used will determine the output of a cell. A typical fully charged lead-acid battery produces approximately 2.11 volts per cell. The chemical action between the metals and the electrolyte (battery acid) creates the electrical energy. Energy flows from the battery as soon as there is an electrical load, for example, a starter motor, that completes a circuit between the positive and negative terminals. Electrical current flows as charged portions of acid (ions) between the battery plates and as electrons through the external circuit.? The action of the lead-acid storage battery is determined by chemicals used, State-of-Charge, temperature, porosity, diffusion, and load. A more detailed description of how a battery works can be found on the BCI web site at http://www.batterycouncil.org/works.html. When the active material in the plates can no longer sustain a discharge current, the battery “dies”. Normally a battery “ages” as the active positive plate material sheds (or flakes off) due to the normal expansion and contraction that occurs during the discharge and charge cycles. This causes a loss of plate capacity and a brown sediment, called sludge or “mud,” that builds up in the bottom of the case and can short the plates of a cell out. In hot climates, additional major causes of failure are positive grid growth, positive grid metal corrosion in the electrolyte, negative grid shrinkage, buckling of plates, or loss of water.? Deep discharges, heat, vibration, and over charging accelerate the “aging” process. Another major cause of premature battery failure is sulfation. It is caused when a battery's State-of-Charge drops below 100% for long periods or undercharging. Hard lead sulfate fills the pours and coats the plates. Please see Section 16 for more information on sulfation. Recharging a sulfated battery is like trying to wash your hands with gloves on. Using tap water to refill batteries can produce calcium sulfate that can also fill the pores and coat the plates. In a hot climate, the harshest environment for a battery, a Johnson Controls survey of junk batteries revealed that the average life of a car battery was 37 months. If your car battery is more than three years old, then it is living on borrowed time. Abnormally slow cranking, especially on a cold day, is another good indication that your battery is going bad. It should be externally recharged, surface charge removed, and load tested. Dead batteries almost always occur at the most inopportune times, for example, after you have jump-started your car, late at night in a dark airport parking lot after returning from a long trip, during bad weather, or when you are late for an appointment. You can easily spend the cost of a new battery or more for an emergency jump start or a tow or for a taxi ride. According to the manufacturers and distributors, most of the “defective” batteries returned during free replacement warranty periods are good. This suggests that some dealers of new batteries do not know how or take the time to properly recharge or test them. This situation is improving with the widespread use of easy to use and more accurate conductance type battery testers made by Midtronics, for example. 3. HOW DO I PERFORM PREVENTIVE MAINTENANCE? 3.1. If the electrolyte levels are low in a non-sealed battery, allow the battery to cool to room temperature, and add only distilled water to the level indicated by the battery manufacturer. If there is no recommendation, add to within 1/8 to 1/4 inch (3 to 7 mm) below the bottom of the filler tubes (vent wells or splash barrels). The plates need to be covered at all times. Avoid overfilling, especially in hot climates, because heat causes the electrolyte to expand and overflow. In an emergency, use rain water rather than reverse osmosis or tap water because rain water does not contain calcium or magnesium. 3.2. Tighten loose hold-down clamps and battery terminals. 3.3. Check and remove any corrosion or oxidation from both ends of each battery cable terminals and both battery posts or terminals. Red and green felt battery terminal washers will help prevent corrosion. They are available at any store selling car batteries. 3.4. Clean the battery top and alternator. 3.5. Check the alternator belt for cracks and retention, if slipping. 3.6. Check the battery cables for corrosion or swelling and replace if necessary with equal or larger diameter wire size. Below are seven simple steps in testing a car battery. If you have a non-sealed battery, it is highly recommended that you use a good quality, hydrometer, which can be purchased at an auto parts store for between $5 and $20. A hydrometer is a float-type device used to determine the State-of-Charge by measuring the specific gravity of the electrolyte in each cell. It is a very accurate way of determining a battery's State-of-Charge and weak or dead cells. If you have a sealed battery or to troubleshoot charging or electrical system, you will need a digital voltmeter with 0.5% (or better) accuracy. A digital voltmeter can be purchased at an electronics store, such as Radio Shack, Jameco, Frys, etc., for between $50 and $400. Analog voltmeters are not accurate enough to measure the millivolt differences of a battery's State-of-Charge or measure the output of the charging system. A battery load tester is optional. A more accurate way of testing the CCA (Cold Cranking Amp) and capacity of lead-acid car batteries is by using a conductance tester, such as a Midtronics, costing between $100 and $600. Visually inspect for obvious problems such as a loose or broken alternator belt, low electrolyte levels, dirty or wet battery top, corroded or swollen cables, corroded terminals or battery posts, loose hold-down clamps, loose cable terminals, or a leaking or damaged battery case. If the electrolyte levels are low in non-sealed batteries, allow the battery to cool and add only distilled water to the level indicated by the battery manufacturer or to between 1/8 to 1/4 inch (3 to 7 mm) below the bottom of the plastic filler tube (vent wells). The plates need to be covered at all times. Avoid overfilling, especially in hot climates, because heat will cause the electrolyte to expand and overflow. 4.3.1. Allow the battery to sit for between four to twelve hours to allow for the surface charge to dissipate. 4.3.2. Turn the headlights on high beam for five minutes, shut them off, and wait five to ten minutes. 4.3.3. With a battery load tester, apply a load at one-half the battery's CCA rating for 15 seconds and then wait five to ten minutes. 4.3.4. Disable the ignition, turn the engine over for 15 seconds with the starter motor, and wait five to ten minutes. If the battery's electrolyte is above 110° F (43.3° C), allow it to cool.? To determine the battery's state-of-charge with the battery's electrolyte temperature at 80° F (26.7° C), use the following table.? The table assumes that a 1.265 specific gravity reading is a fully charged, wet, lead-acid battery. For other electrolyte temperatures, use the Temperature Compensation table below to adjust the Open Circuit Voltage or Specific Gravity readings. The Open Circuit Voltage will vary for gel cell and AGM type batteries, so check the manufacturer's specifications. Electrolyte temperature compensation, depending on the battery manufacturer's recommendations, will vary. If you are using a non-temperature compensated HYDROMETER, make the adjustments indicated in the table above. For example, at 30° F (-1.1° C), the specific gravity reading would be 1.245 for a 100% State-of-Charge. At 100° F (37.8° C), the specific gravity would be 1.273 for 100% State-of- Charge. This is why using a temperature compensated hydrometer is highly recommended and more accurate. If you are using a DIGITAL VOLTMETER, make the adjustments indicated in the table above. For example, at 30° F (-1.1° C), the voltage reading would be 12.53 for a 100% State-of-Charge. At 100° F (37.8° C), the voltage would be 12.698 for 100% State-of-Charge. 4.4.2. If the battery will not recharge to a 75% or more State-of-Charge level or if the built-in hydrometer still does not indicate “good” (usually green or blue, which indicates a 65% State-of-Charge or better). If you know that a battery has spilled or “bubbled over” and the electrolyte has been partially replaced with water, you can replace this old electrolyte with new electrolyte and go back to Step 4.2 above. Battery electrolyte (battery acid) is a mixture of 25% to 35% sulfuric acid and distilled water when fully charged. It less expensive to replace the electrolyte than to buy a new battery. 4.4.3. If a digital voltmeter indicates 0 volts, there is an open cell. 4.4.4. If the digital voltmeter indicates 10.45 to 10.65 volts, there probably is a shorted cell. A shorted cell is caused by plates touching, sediment (“mud”) build-up or “treeing” between the plates. 4.5.1. Disable the ignition and turn the engine over for 15 seconds with the starter motor. 4.5.2. With a battery load tester, apply a load equal to one half of the CCA rating of the battery for 15 seconds. 4.5.3. With a battery load tester, apply a load equal to one half the OEM cold cranking amp specification for 15 seconds. If the battery has passed the load test, please go to Section 4.7 below.? If not, remove the load, wait ten minutes, and measure the State-of-Charge.? If the battery bounces back to less than 75% State-of-Charge (1.225 specific gravity or 12.45 VDC), then recharge the battery (please see Section 9.) and load test again.? If the battery fails the load test a second time or bounces back to less than 75% State-of-Charge, then replace the battery because it lacks the necessary CCA capacity. Did Government Kill the Electric Car?